You use the integrated image preview of Windows Explorer and ask yourself how you can improve the display. 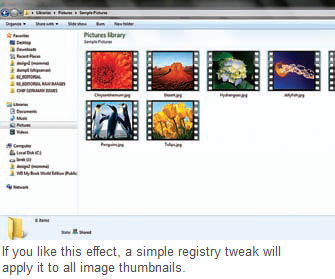 Simple built-in Windows tools can help you create individual frames to the image preview in Explorer. You can thus equip the icons with film strips for instance. You can find the setting for this in the registry. Enter ‘regedit’ in the search field of the start menu and press [Enter]. In case of XP, go to ‘Run’ and then enter ‘regedit’. Now navigate to the ‘HKEY_CLASSES_ ROOT\SystemFileAssociations\image’ key. Here, ensure that the spellings are accurate. Then in the right side of the window, double click the DWORD value ‘Treatment’ for editing. If it is not present, create it with the command ‘Edit | New | DWORD Value’. Now enter the value ‘3’ and confirm with ‘OK’. Every image now gets a border that looks like a film strip. The border can be completely disabled using the value ‘0’ but even the narrow borders resulting from the values ‘1’ and ‘2’ are hardly visible and thus unsuitable. Close the registry and restart Windows Explorer. Individual images now have perforated borders in the Tiles and Thumbnails views, just like classic film strips.